Winter came in with a roar, didn’t it? If you were scrambling to find the right solution to safely (and quickly) take your dog or puppy outside in frigid conditions, you’re not alone. There are so many options to keep your puppy’s paws safe from ice, salt, and cold weather that it may be hard deciding what’s right for you. Here are a few tips to help you navigate all things winter-dog-paw-related. 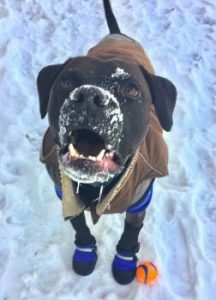 Depending on your dog, booties may be the best option to keep your pup’s paws protected when outside in winter months. However, most dogs hate the way boots feel on their paws. And, technically, you should spend time BEFORE winter arrives teaching him to like his booties—but, the weather is unpredictable. So, if you haven’t trained your dog to accept his booties happily, there’s still hope. Don’t create negative associations with your dog’s boots. As tempting as it is, don’t laugh at your dog when he’s trying to walk for the first time in boots. Your pup is emotionally savvy, and your heckling will only make him hate his booties more. And, please don’t drag your dog, ever. 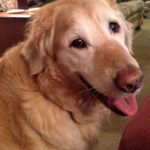 If your dog doesn’t walk in boots, try crouching down—if your knees can handle it and your dog doesn’t have a bite history. This inviting posture is more encouraging to sensitive dogs than hovering and repeating “COME ON” ad nauseam. You can also encourage walking by placing amazing treats (like hot dogs, boiled chicken, or cheddar cheese) on top of your shoe. When dogs drop their heads, they naturally relax, and a dog who’s feeling at ease will more likely walk than a stressed-out pooch. If your pup still won’t budge, it’s time to make booty training a priority. Pick a time of day in the house where you merely reward your dog for wearing one boot, then two, then three. You may also consider using a lighter weight boot. The first booty I tried with Gavin was massive because he gets so cold so quickly, and I wanted to protect his delicate paws as much as possible. But, the heft of thick-soled boots was too much for him, so I switched to MuttLuks. The fleece lining keeps his toes toasty, and I love the length of the sock which adds extra warmth. Occasionally a wayward boot slips off into the snow, but when I’m diligent about pulling the sock all the way up so there’s no gap between his toe and the boot, they stay on nicely. If you’re looking for protection from harsh, unsafe sidewalk salt and don’t need added warmth, a lot of my dog-loving clients and friends rave about PAWS disposable boots. They’re relatively easy to get on your dog’s paws, and because they’re super thin (like a balloon), fussy pups may more quickly acclimate to wearing them. Let’s say your dog loathes wearing booties, how do you keep his paws protected? Finn loved walks, no matter how cold it was, but I knew he’d be miserable in boots. So, I used various salves and sprays over the years. The trick when using thick balms like Musher’s Secret is to cover your dog’s paws RIGHT before walking outside. Otherwise, the goop makes a mess on your floor. However, even the thickest layer of goop was no match for some of my neighbor’s sidewalks covered in layers and layers of non-pet friendly salt. To keep Finn’s paws protected, as we approached those sections, I’d ask him to walk in the parkway rather than the sidewalk to prevent any chance the salt might work its way through the protectant and burn his paws. When we arrived back home, I wiped Finn’s paws off with a warm, wet washcloth to assure he didn’t track in dirt and salt and to clean any remaining goop off his paws. If you forget to rub protectant on your dog’s paws before an outing, don’t use a wet washcloth. Lingering salt on your dog’s paws may be absorbed, according to a trusted veterinarian friend. Instead, wipe your dog’s paws with a dry cloth. I’m sure you’re as ready for sun and spring as I am. However, I hope these quick tips will help keep your dog or puppy happy, safe, and comfortable all winter long.